Marcel Proust was an acclaimed French writer who became famous for his work In search of Lost time. He is believed to be the best writers to date. He started writing and publishing his work even when he was a child. Many of his works were published in his school literary magazines when he was a student. Afterwards, he started to publish his work regularly in magazines initially . Later, during the year 1896, a collection of his work was published in the form of a book which was sold twice the price of the other books during this period of time. During the year 1908, he sharpened his skills by developing a writing style for himself. 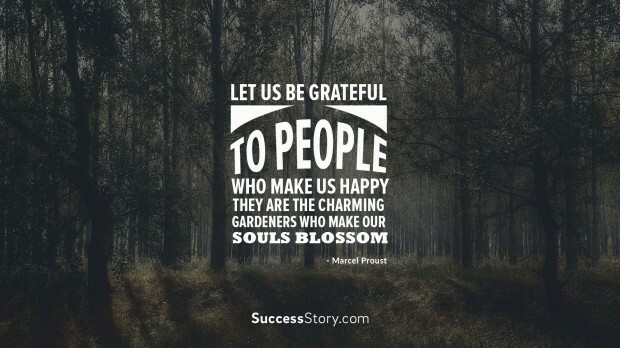 "Let Us Be Greatful To People Who Make Us Happy They Are The Charming Gardeners Who Make Our Souls Blossom"
We all admire and love those who make us happy. They are the people who give meaning to our life. Just like that Marcel Proust in one of his quotes said that they are the gardeners who water our souls to see that they blossom and spread the fragrance of happiness. Such people should always be respected and remembered with respect. Yes, they really deserve our love and respect. He also says that even though happiness is required to keep our body and mind healthy. But the real fact is that it is the sorrow and grief who are the best teachers in life. They help to increase the power of the mind.We should never forget that experience is the best teacher. We should dare to dream big. Because small dreams will never let you grow. He says that dreaming a few is dangerous and the best remedy for it is to dream big which would help you to succeed in life.